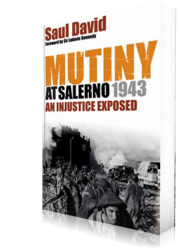 In late September 1943, almost 200 veterans of General Montgomery’s Eighth Army were arrested for refusing repeated orders to join units of the US Fifth Army at the Salerno beachhead in sourthern Italy. Within six weeks, all but one had been found guilty of mutiny, their sentences ranging from five years’ penal servitude to death. A thoroughly enjoyable and interesting book and the author makes his case well’ Journal of the Royal Military Academy Sandhurst’A detailed account… David is right to stress that the mutiny stemmed from the men’s reluctance to fight amongst strangers rather than their reluctance to fight at all, and that many of the mutineers preserved a dignified and soldierly attitude throughout the proceedings. An important book’ Military Illustrated’Mr David has added considerably to the knowledge of the Salerno mutiny. This book should be read by anyonewith an interest in the episode.